Rangpur, Dec 22 (Just News): A clash between police and supporters of a defeated ward councillor candidate in Rangpur city election left at least 25 people injured this morning. Police charged batons when supporters of Abul Monzur Kuthial, candidate of ward no. 8, were protesting “vote rigging”. Kuthial lost by one vote in yesterday’s Rangpur City Corporation election. His supporters brought out a procession around 11:00am alleging vote rigging. Babul Mia, officer-in-charge of Rangpur Sadar Police Station, said the defeated candidate was arrested on the spot and added that police dispersed hooligans who were trying to stir up chaos. On the other hand, around 15 were injured after the supporters of two councillor candidates of ward no 1 clashed at Ban-Chandipur village last night, locals say. 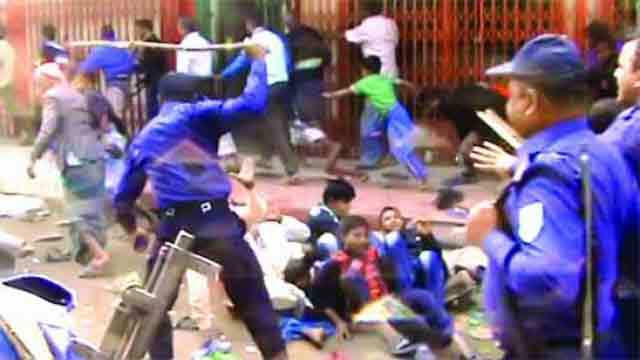 The clash took place between supporters of Rafiquzzaman Ganja and Kamruzzaman.